Does Attic Insulation Keep You Cool in Summer? Yes. Attic insulation helps keep you cool in the summer. Easy answer, right? Imagine you just baked some cookies. Chocolate chip ones. With walnuts. The oven timer just went off, so it’s time to pull out the pan and let the cookies cool. You reach into the oven with your bare hands, grab the hot pan, and set it on the stove top. Except that you don’t. You use an oven mitt. The oven mitt is essential because it prevents the heat from the pan from migrating to your hands. In other words, it insulates your hand, which is a relatively cool entity, from the baking pan – a relatively hot entity. Any time you want to protect yourself or even just a part of your body from heat exposure, insulation really comes in handy. Heat migrates to cool places. That’s really the crux of it all. If you’re in an air conditioned room that’s cooler than the outdoors, you can bet that warmer outdoor air (and all of the heat it contains) is constantly trying to migrate into that cool space. In peak summer, this happens more gusto. Why? Because there’s more heat. Simple as that. So, how do you square that with the conventional heat-related wisdom we’re all familiar with – that “warm air rises” and “cool air falls?” Isn’t heat always entering the bottom of a structure, rising to the top, and pushing the cool air downward? Nope. That’s not always what’s going on. Heat certainly can rise within the confines of a structure, such as a house, but that’s not how heat behaves under all conditions. Again, heat migrates to cool places. Sometimes, that means it moves up. Other times, that means it moves down. Or sideways. Or diagonally. In other words, it’s true that warm air rises… except for those occasions when it falls, sinks, drops, descends, creeps, crawls, and plummets. The notion that “warm air rises” is actually a reference to the stack effect. Pretend it’s January. There’s snow everywhere; kids are shoveling walkways; snow plows are clearing the streets; local polar bears are hunting for seals. You’re inside your house on this cold winter day, and you’re running the furnace. The furnace forces warm air into your home through supply vents in the floor. Air from the furnace is warmer than the air it’s replacing, and that warmth does, indeed, rise to the top of your home. So, a warm building + cold outdoor temperatures = warm air rises. This is the stack effect in action! 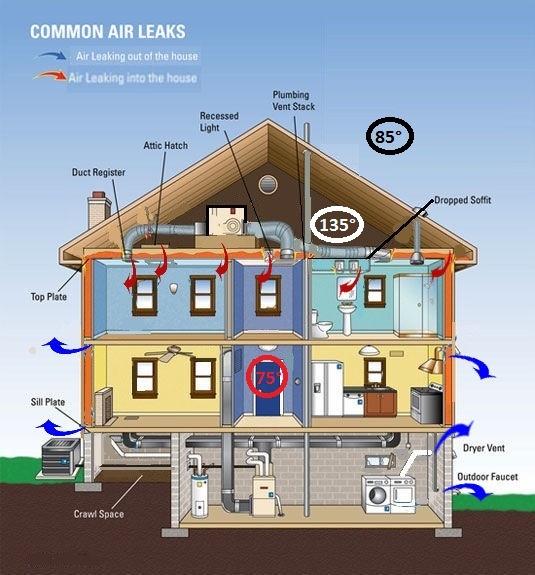 The conditions are right for warm air inside your home to rise to the top. Eventually, the heat seeps through your insulation and the warm air escapes through little air gaps in your attic. 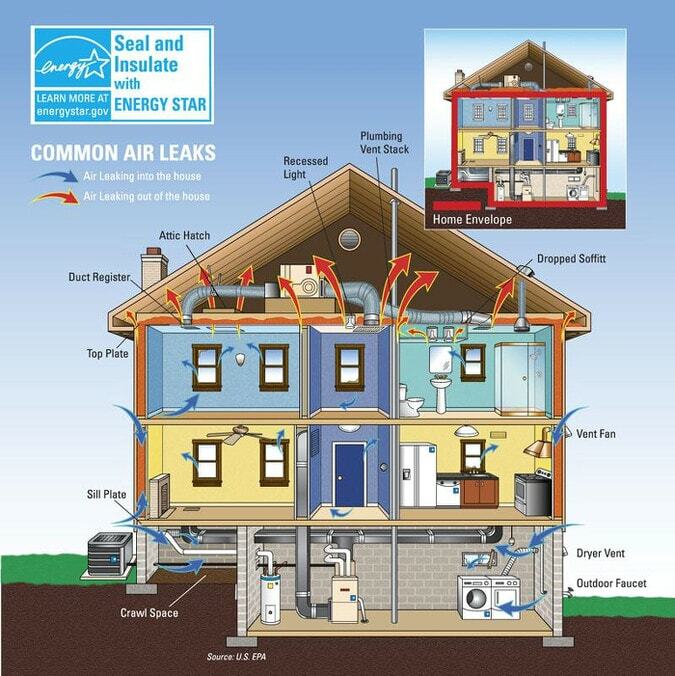 The more insulation and fewer air gaps you’ve got, the slower the heat and air escape. And the less often you have to run your furnace. During summer, the reverse stack effect occurs. Warm air doesn’t always rise. A lot of it migrates downward. Ok, so attic insulation is good during the winter. As warm air rises, it hits the insulation and stays put. You’re more comfortable, and you can afford to pay your heating bill. This is why most people think they have insulation in their attics. But insulation is also there to keep you comfortable in summer. When it’s hot outside, the stack effect operates in reverse. Instead of warm air entering your home, rising to the top, and escaping to a cooler environment, the outdoor heat goes out of its way to enter your cool, air conditioned house. And where does the heat of the sun beat down the hardest? Your roof, that’s where. As the sun’s powerful rays bathe your black, asphalt-shingled roof throughout the day, your house gains a lot of heat. Remember, you’re running an air conditioner during much of this time. Your house is cooler than the outdoors, and the heat “wants” to occupy the cooler area. What can prevent the heat being soaked up by your roof from entering your living space? Your attic insulation, that’s what. Just as insulation keeps heat in during winter, it helps keep it out during summer. If you’ve got a two-story house and you’re used to upstairs rooms always being hotter than downstairs rooms, it’s not necessarily because the heat inside your home is rising to the upper floor. A big part of the problem might be inadequate or poorly installed attic insulation. Insulation without air sealing performs extremely poorly. Ever gone in your attic and wondered why some sections of insulation look dirty and others don’t? It’s often the sections of insulation near light fixtures and bath fans that are the dirtiest. Why is that? More often that not, soiled areas of insulation are the result of air leakage. As air leaks through the gaps between your ceiling and your attic, it carries little bits of dust that dirty up the insulation. The air also carries – and you knew this was coming – heat. 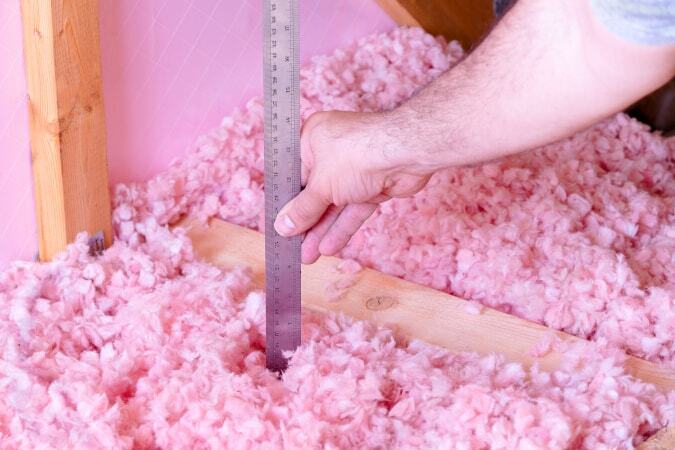 You can pile lots of insulation into an attic. It won’t ever plug those air leaks. And lots of heat will keep migrating from your attic to your living space – even after you achieve a super high R-value. It’s like wearing a knitted sweater on a cold, windy morning. The sweater helps keep the heat in, but it does very little to keep cold air from getting through. To really get warm, you’ll need to put a windbreaker over the sweater. Then you’re blocking heat transfer (insulation) and stopping cold air from reaching you (air sealing). Attics work the same way. You can block heat with insulation, but you’ve also got to seal air gaps. Otherwise, hot air will always creep through the areas of least resistance and make you feel hot. So. Does air sealing + adding insulation = feeling cooler upstairs in August? Which way does your house face? If certain rooms get lots of sun exposure from the side, insulation and air leaks in the walls could also have a big impact on comfort. What about airflow? HVAC design is a big deal. If you’re not getting enough airflow from your AC in upstairs bedrooms, adding insulation might only solve part of your problem. And so on. Ultimately, attic insulation does help you stay cool in summer. But it’s not necessarily an end-all, be-all solution. Every home is different and requires a unique set of fixes.